NOTICE: Portions of this trail are currently closed due to wildfire damage. This scenic trail system allows for a number of recreational activities including biking, hiking, boating, and horseback riding. The 8 foot wide trail is designed for pedestrian and bicycling traffic; motorized traffic (such as trail bikes and off road vehicles) are strictly prohibited. Location: Near Redding above and below Keswick Dam. 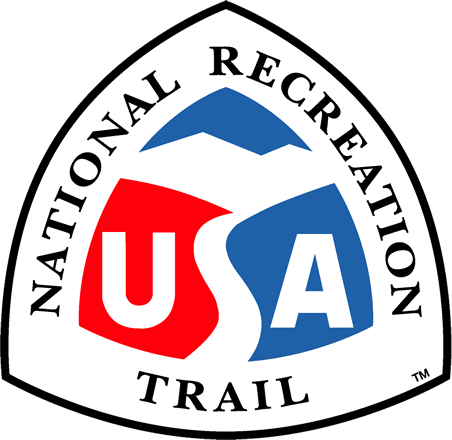 Redding is home to the national headquarters of American Trails. The City of Redding was a co-host of the 2000 National Trails Symposium. In 2000, Redding and its partners initiated an aggressive eight-year, $30 million trails and bikeway capital improvement program. The partners include California State Parks, CalTrans, Bureau of Land Management, Bureau of Reclamation, National Park Service, California Boating and Waterways, California Wildlife Conservation Board, California Department of Water Resources, California Conservation Corps, Sacramento Watershed Action Group, Turtle Bay Exploration Park, Federal Highway Administration, private developers and The McConnell Foundation. When the capital program is completed in 2008, the Sacramento River Trail will be connected to hundreds of miles of mountain bike, hiking and equestrian trails at both the Whiskeytown and Shasta-Trinity National Recreation Areas. The Sacramento River Corridor runs through the center of Redding. The river corridor has provided a unique opportunity to develop an urban trail system within several miles of lush riparian habitat. 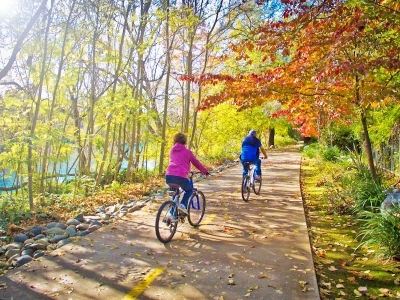 Ten miles of trails have been built so far, connecting residential neighborhoods to regional parks, federal open spaces, the 220-acre Turtle Bay Exploration Park and, most recently, to a regional commercial district. Over twenty partners have invested or pledged dollars towards the completion of the River Trail. The Bureau of Land Management and Bureau of Reclamation have contributed land. Construction dollars were given by the California State Department of Parks and Recreation, the National Park Service, the Federal Highway Administration, and the McConnell Foundation. Many of the trail amenities, such as drinking fountains and benches, were donated by boy scouts, service clubs, a local builders exchange and private contractors. 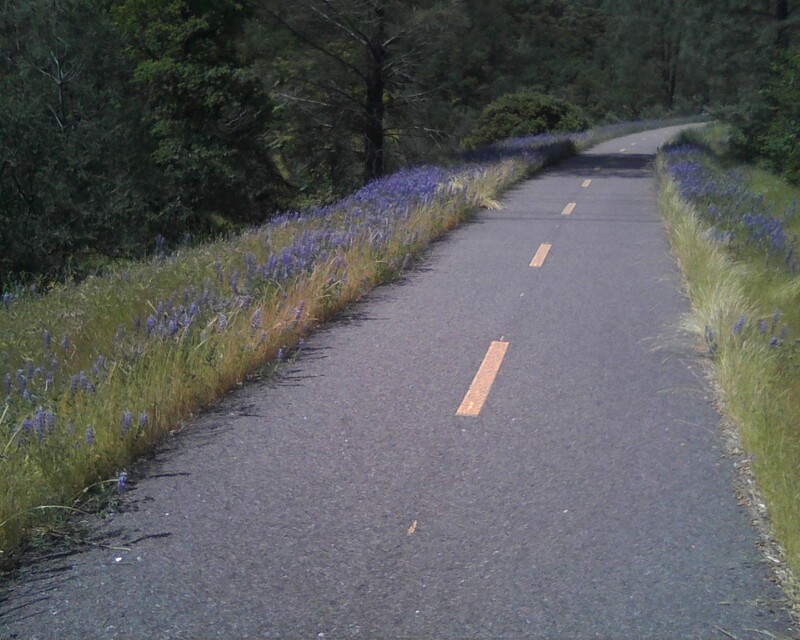 Based on a partnership between the City of Redding, Bureau of Reclamation, Bureau of Land Management, and Shasta County, these trails are an example of what is possible through a joint effort between various agencies and local groups. 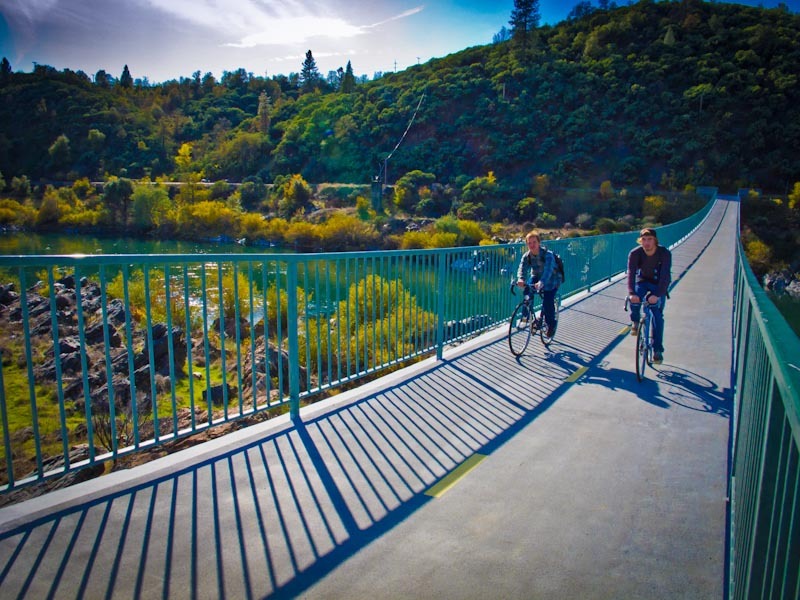 Once completed, the river trail system will provide 20 miles of public access to the Sacramento River between Shasta Dam and downtown Redding. This scenic trail system allows for a number of recreational activities including biking, hiking, boating, and horseback riding. The 8 foot wide trail is designed for pedestrian and bicycling traffic; motorized traffic (such as trail bikes and off road vehicles) are strictly prohibited. Because of this, the trail attracts people of all ages - from the dedicated jogger to the couple out for an evening stroll, from the weekend bicyclist and family outings to the fisherman looking for that ideal angling spot. Starting at the Diestlehorst Bridge entrance, the southern portion of the trail covers 2.5 miles of fairly flat spaces and rolling hills to the pedestrian footbridge below Keswick Dam. This bridge is a 13-foot-wide 420-foot-long concrete stress-ribbon bridge unique to this continent. This bridge type has been used in Czechoslovakia, Switzerland and Germany and has received national awards from the Portland Cement Association and the California Parks and Recreation Society for being an environmentally safe bridge. Crossing over to the north side, the trail continues for another 1.4 miles over steeper, more rugged terrain that contours with the river. With a slight break through a comfortable residential area, the trail then picks up again for .8 of a mile and exits on Lake Redding Drive, near Caldwell Park and the original entrance. From start to finish, the complete loop is approximately 6 miles and can easily be walked in a couple of hours. To complement the original 6-mile loop a 1.7 mile extension of the Sacramento River Trail has been added on the river's north bank from the Diestlehorst Bridge to Benton Ranch. The new section of trail is 12 feet across and runs downriver through Lake Redding and Caldwell Parks under the Market Street vehicle bridge, stopping near the downstream end of Benton Ranch. Plans are now in the works to complete another 10 miles of trail and rail-trail which will run north and link the stress-ribbon bridge to the Shasta Dam.The River Trail linking to and running through the Turtle Bay Exploration Park is what really makes this trail unique. The Alliance, a Redding not-for-profit organization, is developing a 300-acre interpretive park on both banks of the Sacramento River, called Turtle Bay Exploration Park. Partnership is at the heart of Turtle Bay. Through the merger of four organizations, Carter House Natural Science Museum, the Redding Arboretum by the River, the Forest Museum and the Redding Museum of Art & History, The Alliance of Redding Museums links these separate disciplines into one coherent experience - Turtle Bay. Turtle Bay will tell the story of the region and its people through wildlife exhibits, gardens and trails, and a 34,000 sq. ft. museum. The network of paved and unpaved trails unifies the varied museum experiences, and includes a spectacular crossing of the Sacramento River over the glass-decked Turtle Bay Sundial pedestrian bridge designed by Santiago Calatrava, world renowned architect, engineer, and artist. 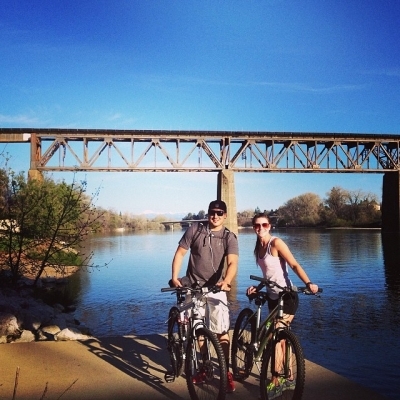 It will be the highlight of the Sacramento River Trail, the centerpiece of the new regional trail system, and become the icon for the north state. Two major property owners, the City of Redding and the McConnell Foundation, have provided long-term leases to Turtle Bay for the project, which is directly accessed via state highway, city streets, and Redding's urban river trail system. 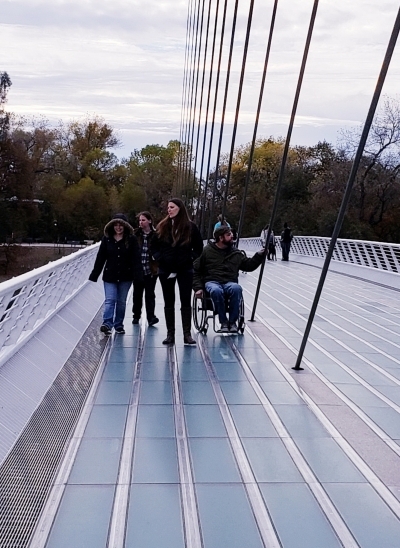 The Turtle Bay Sundial Bridge will actually be part of the City of Redding's Sacramento River Trail system, and Turtle Bay will operate a cafe, public restrooms, drinking fountains, and other amenities at the trail entrance. Turtle Bay has a number of other community partnerships. A coalition of Turtle Bay, Shasta College, Sequoia Middle School, and a private environmental engineering firm are restoring salmon habitat on Sulphur Creek on the Arboretum. The Sacramento River Trail is viewed as a necessary recreation amenity in Redding. It is also viewed as a vital infrastructure component that contributes to their multi-modal transportation system and helps to establish a sense of place. 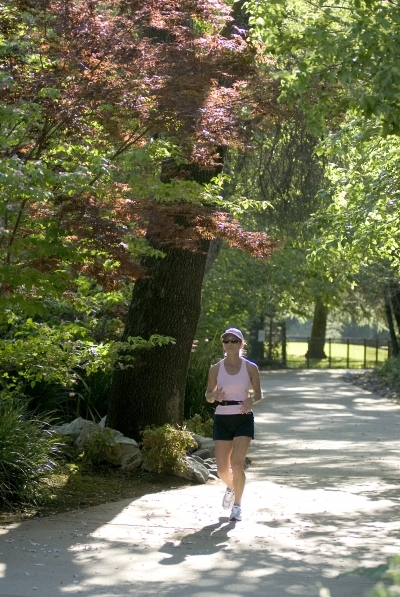 Trails are an important part of who they are as a community. A beautiful fall day for a ride along the river. Photo by Chris Flentye. Sundial Bridge “Think Pink” Breast Cancer Awareness Event. Photo by Helen Johnson. Callie's first time across the Sundial Bridge. Photo by Sue Crowe. View looking down on the Sacramento Rail Trail from across the river. Photo by Susie Gavigan. Summer Rail Trail Ride. Photo by Unknown. A run along the river. Photo by Krista Buckel. Middle Creek Tail - Summer 2017. Photo by Mike Wiseman. American Trails staff enjoying a stroll on their home base NRT. Photo by Sue Crowe. The Sundial spire against a overcast winter sky. Photo by Sue Crowe. Sundial angles against the sky. Photo by Sue Crowe. Contrast in colors. Photo by Sue Crowe. American Trails staff enjoying a stroll on their home base NRT!. Photo by Sue Crowe.